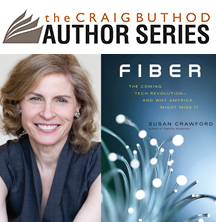 Susan Crawford is the John A. Reilly Clinical Professor at Harvard Law School and the author of Fiber: The Coming Tech Revolution—and Why America Might Miss It. The book explores how the giant corporations that control cable and internet access in the United States use their tremendous lobbying power to tilt the playing field against competition, holding back the infrastructure improvements necessary for the country to move forward. The program is free, but tickets are requested. Click here to order. 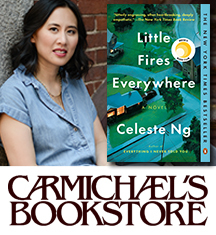 Celeste Ng is the New York Times bestselling author of two novels, Everything I Never Told You and Little Fires Everywhere (just released in paperback). Join her for a discussion of her work. Fans of Dorothea Benton Frank’s Carolina Lowcountry will delight in Queen Bee, an evocative tale that returns readers to her beloved Sullivan’s Island. 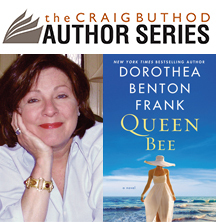 The Craig Buthod Author Series - named in honor of former library director Craig Buthod - is an endowed library program that brings award-winning and New York Times bestselling authors to Louisville. Previously called Authors at the Library, the series was endowed in 2015 by donors to the Library Foundation. To make a gift to the Craig Buthod Author Series endowment, click here.